Spanish | WHY DO WE LOVE CHOCOLATE? Chocolate literally grows on trees, appearing in its raw state as pods on the 40-60 foot tall trees known botanically as “Theobroma cacao,” which means “food of the gods.” This widebranching tropical evergreen has grown wild in Central America since prehistoric times. It also grows in South America, Africa and part of Asia. · The Mayan Indians of Mexico began using a form of chocolate as early as 600 a.d., at which point they worshiped the cocoa bean as an idol, a literal gift from the heavens. · Cocoa beans were thought to have fearsome magical powers by the Maya and were carefully used in rituals, religious ceremonies and healings by priests. The Maya used cocoa medicinally as a treatment for fever, coughs and even discomfort during pregnancy. · The Maya had a God, Ykchaua, who served as the patron of cocoa merchants. · The Maya were the first to invent a cocoa drink, a hot, mostly bitter beverage made up ground cocoa pods and spices. · In Aztec myth, the god of agriculture, Questzalcoatl, traveled to earth carrying the cocoa tree from Paradise, because it would bring humans wisdom and power. · Chocolate became so highly regarded by the Aztecs that it was used as a form of currency along with gold dust. · The Florentine Codex, one of the main historical sources describing Aztec life, calls chocolate “The drink of nobles,” and notes that it must be prepared with the meticulous care due to its powerful nature. · Although Columbus returned to Europe with the first cocoa beans, no one knew what to do with them and they were dismissed in favor of other trade goods. · Europeans got their first real taste of chocolate when Emperor Moctezuma met the explorer Cortes and his army with a foaming hot chocolate drink. The story begins some 3,000 years ago in the jungles of Mexico and Central America with the chocolate tree, Theobroma Cacao, and the complex processes necessary to transform its bitter seeds into what is now known as chocolate. This was centuries before chocolate was consumed in generally unsweetened liquid form and used as currency by the Maya, and the Aztecs after them. 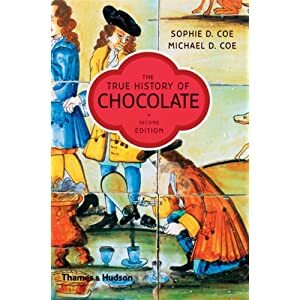 The Spanish conquest of Central America introduced chocolate to Europe, where it first became the drink of kings and aristocrats and then was popularized in coffeehouses.